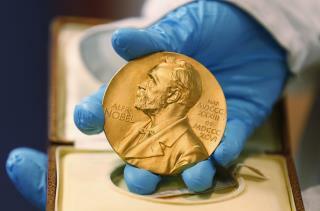 (Newser) – British-born scientists David Thouless, Duncan Haldane, and Michael Kosterlitz were awarded this year's Nobel Prize in Physics on Tuesday for work that "revealed the secrets of exotic matter," the prize committee said, per the AP. The three "opened the door" to an unknown world where matter takes unusual states or phases, the Royal Swedish Academy of Sciences said. They were honored for their "theoretical discoveries of topological phase transitions and topological phases of matter." Thouless, 82, is a professor emeritus at the University of Washington; Haldane, 65, is a physics professor at Princeton University in New Jersey; and Kosterlitz, 73, is a physics professor at Brown University in Providence, RI. Well, I thought it could be redemption from the cracker jack box fiasco. But looks like the usual politics at work again. "Nobel judges often award discoveries made decades ago, to make sure they withstand the test of time" So this says with Obama.... They just went full retard... Got it.